We are Two Row, a digital design studio that puts an emphasis on beautifully crafted user experiences. Our focus is bringing forth the heart of your organization with timeless style. Your branding should reflect you. Your digital presence should perform to meet your goals. We will work hard for you and deliver. No star goes on stage without a team helping them look their best. We’ll be that team for you. It’s easy to get lost in a room of billions of people. Let us help you find your audience and stand out. Investing in the creation of an app is a big undertaking. We will help you focus it to the benefits you want and need. Graphics span both digital and print and so should your message. Let’s build long-lasting ways to communicate. “Two Row really helped us out of a difficult situation. They went above and beyond the call of duty to help with getting control of our site back and redesign our website, acquire domain names and help with email functions. [Two Row] listened as I explained the basics of our industry and what I was looking for in a website (and the possibility of e-commerce in the future). [They] basically took care of everything and made it very easy for me. [They] also helped us with some of our network issues as well. Would give them 10 stars but apparently I'm only allowed 5. Thanks for everything guys." "Picking a web designer/developer was an incredibly stressful task. I didn't understand the lingo, what to look for in a good/bad dev, and didn't understand the technology well. 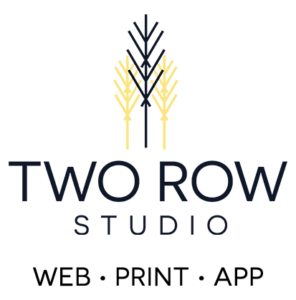 After speaking with 20 different designers and developers we were fortunate to find Eric and the team at Two Row, and it has been a great experience ever since. Eric, Tanya, and the Two Row team were able to work with us effectively long distance. Their turnaround time, flexibility, attention to detail, and willingness to explain esthetic concepts, effective information arrangement, what works and doesn't in web design was awesome. They also did a great job of respectfully setting expectations. They were quick to respond through email and entertained a lot of our requests to see concepts and try out our ideas.Not only are they great at what they do, but they are also great people (which is an awesome bonus in the working world. )I can't recommend them enough. They are worth every penny. A short phone conversation with them would reveal that though."